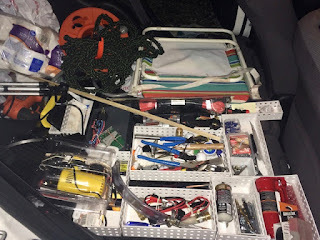 12 Midnite - Ever since Little Honda began towing MsScampy, we have used the rear area of Honda for storing tools and supplies. We bought various sizes of plastic boxes from The Container Store in order to put some order into this storage area. It evolved into a mess. The plastic boxes have no fixed location. Which means that stuff is sometimes a little difficult to locate. But the main problem with present storage, is that there just isn't a way to sort stuff out. Also, as you may see, this storage mess occupies the entire area! Harbor Freight to the rescue! What to do was on my mind. When suddenly a storage cabinet popped in there! 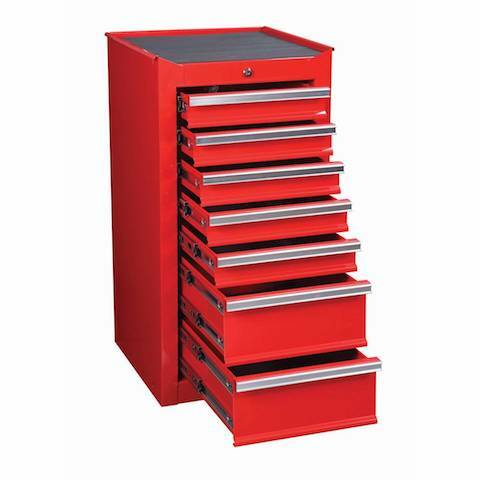 We believe that this cabinet is in-stock at Harbor Freight in the City of Murrieta, about 26 miles from Jojoba Hills RV. Click [Here] to view the Harbor Freight online ad for this cabinet. While Breakfast Camped in the WalMart parking lot in Temecula, I read the comment/suggestion by W3. Wow! I bought  of these Drawer Carts. They are inside Little Honda right now! And, they work sooooo well! To view these Drawer Carts, Click [Here]. This afternoon, the clicker stopped operating Honda's lock! We phoned a Honda dealer here in the City of Temecula. A service advisor tried to help over the phone. When that help did not work, we headed over there. The guy at Honda found what was wrong right away. A rag held the hatch door open just a bit. When the rag was moved, everything worked! We had planned to be back at Jojoba Hills before dark. With the Honda repair, we are here in Temecula much too late. The main reasons for today's trip was for propane and groceries. Of all our errands, only WalMart Grocery was left to do. We had a Team Meeting to figure this thing out. Should we go to the WalMart now, and return to Jojoba in the dark? Everybody knows that George is not good in the dark. It was decided to remain in Temecula for the nite, and return to Jojoba in the morning. PS: When you click on our Temecula "Nite Camp Location Link" you may see that 24 Hour Fitness is close by! You might want to think about how much weight that will put in the back of your little car. I bought the storage units suggested by W3 [See comment below]. They are plastic. Light weight but strong. If it will be visable, it will be a magnet for thieves no matter what you store in it and yes, do consider the weight. Several plastic drawers in a frame would be a simpler solution. The ScampyRV Team does not concern themselves with criminal types! If somebody swipes are stuff, we buy more stuff. We bought the plastic storage drawers suggested by W3. See W3's comment/suggestion below. There are a bajillion variations on the theme available from numerous sources at very reasonable prices. I read your comment/suggestion while Breakfast Camped in the WalMart parking lot. I love these cabinets soooooooooooooo much!! I bought the 3-drawer. They are inside Little Honda now. Works great! Fantastic suggestion!